PHILADELPHIA -- As Philadelphia Eagles fans reveled in their team's first-ever Super Bowl win, some celebrations crossed the line, to say the least. Throngs of fans filled the streets of Philly after the Eagles beat the New England Patriots on Sunday. One reveler took his celebration one step too far. 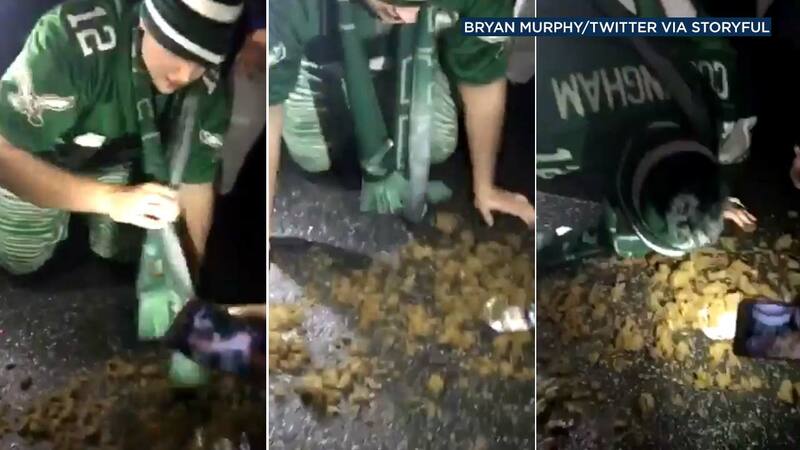 A video posted to Twitter shows a man clad in an Eagles jersey, hat and scarf eating what appears to be horse poop as crowds cheer him on. The video shows the man approaching the pile of feces, getting on his knees and kneeling forward. He bends down head-first into the pile and when he lifts his head back up, you can see that he has a mouthful of poop. This incident was not the only one that shows revelers taking their celebrations a bit too far. Another video posted to Twitter shows a car flipped onto its driver's side at Broad and Walnut. Another video shows an Eagles fan doing a trust fall off the awning outside the Ritz Carlton in Center City, Philadelphia. Video captured the moment a Philadelphia Eagles fan did a trust fall off the awning outside the Ritz Carlton in Center City Philadelphia.